See how the color changes from top to bottom? 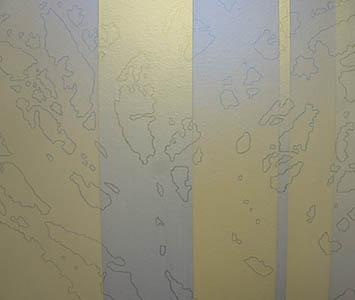 The stripes are obvious between the interference gold paint and the interference blue paint. The gold’s complement is more purple, the blue’s compliment is more orange. This is all because of the tiny titanium coated mica flakes that are in the paint. 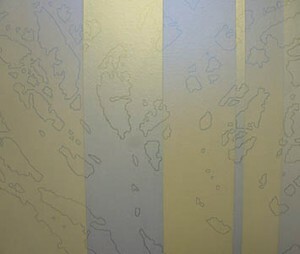 The goal when using these colors is to get the flakes to lay flat, so they can reflect as much light as possible. To do this the layers have to be incredibly thin. In this painting, I have at least 10 layers per color. I don’t count, I judge it by appearance, by how well I can see the drawing underneath. If the drawing is no longer visible at some angle then I’m ready to move on. “The property at work in the Interference Colors is known as light interference, most commonly seen in the rainbow effect created by a thin layer of oil on the surface of water. Thomas Young identified this phenomenon in 1801 in a series of investigations that were eventually instrumental in advancing the theory for the wave-like nature of light. Whenever light strikes a boundary between two materials of different densities, the light will either be reflected or refracted. If the refracted light encounters yet another boundary between materials of different densities, this light will again either be reflected or refracted. This process continues every time a new phase is encountered. “In the following figure, a ray is incident on an interface between two dissimilar media. A plane that includes the incident ray and a line drawn normal to the surface is called the plane of incidence. This plane also contains the reflected and refracted rays. A refracted ray is transmitted into the second medium and travels in a different direction than the incident ray. The angle that the incident, reflected, and refracted rays make with the surface normal are called the angles of incidence, qi , reflection, qr, and refraction, qt, respectively. The refractive index of medium 1 is n1 and of medium 2 is n2. Illustration of incident, reflected, and refracted rays. Interference colors are different from the markings on US money bills which have to be applied with fancy tech that modern material physicists came up with, as I was told at an art opening by a material physicist. I couldn’t answer his questions, so I had to look this all up. He had great questions, turns out there are about no similarities. This will be in my next post as I don’t have a dollar bill to look at right now. It’s late at night. I have insomnia and sometimes I deal with it by writing or working. Might as well, right?